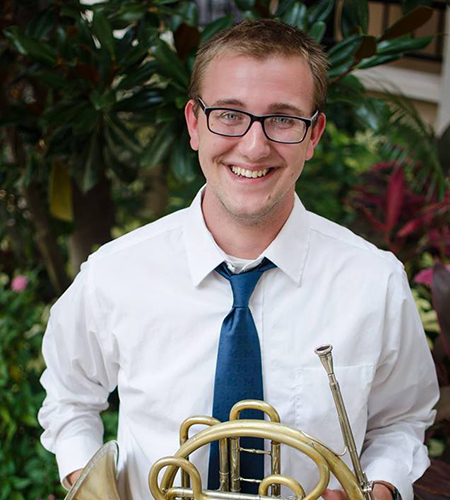 University of Michigan alumnus Cody Halquist was inspired by his family’s musical talents to pursue a career in French horn. Halquist grew up in Brockport, New York, where his dad was the band director at Brockport High School. In high school, he realized he wanted to continue studying and playing music professionally. He was drawn to the University of Michigan after attending a summer music program for high school students. At Michigan, he enjoyed spending time with fellow Stamps Scholars, including through a Habitat for Humanity trip to New Orleans. He played with all of the music school’s bands and orchestras at one point, as well as in a few operas and performances through the musical theater department. He said his most memorable music experience was playing with the symphony band “because it takes the highest level of wind players.” Although, nothing was better than when his parents had the opportunity to come to his shows. He used his Stamps enrichment fund to perform and learn in London, playing for musicians in the London Philharmonic and from the Royal College of Music. One surreal experience was sitting onstage during a London Philharmonic rehearsal. He said this trip and his time at the university were humbling and helped him grow as a musician. He knew he wanted to continue his education and was accepted into the Yale School of Music. He worked with horn professor William Purvis while completing master’s degrees in music and musical art. The most important lesson Purvis gave Halquist was to change the way he approached music mentally, teaching him to work smarter, not necessarily harder, to improve. Halquist put this knowledge into practice through his involvement with Yale’s Music in Schools Initiative, which brings music education to New Haven Public Schools. A memorable experience during his time at Yale was traveling to South Korea to perform for a week in Seoul as the Symphony S.O.N.G. (Symphony Orchestra for the Next Generation). One thing that stuck with him was the size and enthusiasm of the audience. The highlight of his degree program, though, was playing as part of a chamber ensemble at the Kennedy Center through the Conservatory Project in 2016. Since graduating in May, he started working as a freelancer, performing around Connecticut and New York, including with the Hudson Valley Philharmonic, New Haven Symphony, and the Richmond Symphony. Although he knows that classical music is a tough industry, he has proven to himself that he can survive the stressful and often disheartening process of music auditions. He said that the Stamps Scholarship not only provided him the financial freedom to pursue his career, but also the networking skills necessary to succeed in music.